Laurinburg City Hall is located at 305 West Church Street, Laurinburg, NC 28353; phone: 910-276-8324. Photo: John Blue House, ca. 1895, State Route 1108, Laurinburg, NC. Listed on the National Register of Historic Places in 1978. Photographed by User:Corydjhughes (own work), 2011, [cc0-by-1.0 (creativecommons.org/publicdomain/zero/1.0/deed.en], via Wikimedia Commons, accessed August, 2014. Incorporated in 1877, Laurinburg is the largest town in Scotland County and contains older residential neighborhoods, new subdivisions, a late nineteenth- and early-twentieth-century downtown commercial section, suburban shopping centers and industrial diversification in the outlying areas. The first families to settle in the area now known as Laurinburg arrived in 1785. 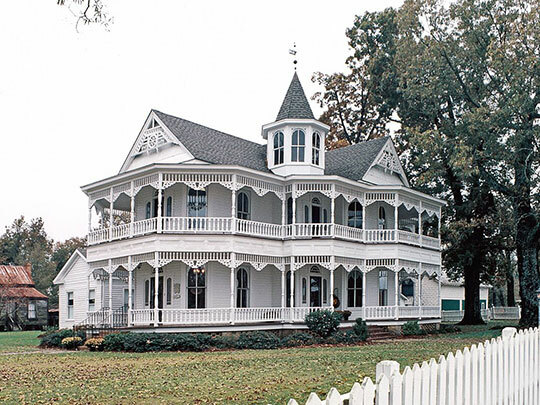 The name comes from the prominent McLaurin family, who operated a general store in the area in the early- to mid-1800s. The name of the town was first written with an "h" — Laurinburgh — and was pronounced Laurinboro. The first post office, chartered on December 6, 1856, with the appointment of L. A. McLaurin as postmaster, was initially called Laurinburgh, but later the "h" was dropped. By 1840, the settlement still consisted of only three dwellings, the store, a saloon, and several small outbuildings. In 1852, a private academy named Laurinburgh High School was organized with Duncan McLaurin serving as the school's first principal. In 1853, the Wilmington, Charlotte, and Rutherford Railroad announced that it would build through Laurinburg and the first trains began running in 1861. During the Civil War, the railroad moved its railroad shops from Wilmington to Laurinburg. The Union Navy was concentrating a good deal of its effort on closing the entrance to Wilmington at Fort Fisher and the railroad management felt that the shops would be safer inland. Although originally intending to remain in Laurinburg only until the end of the war, they later purchased additional land and remained until 1894. Many people in the town lived in fear that when the shops left, the entire economy of the area would collapse. Beth Keane, Retrospective, Laurinburg Commercial Historic District, Scotland County, NC, nomination document, 2003, National Park Service, National Register of Historic Places, Washington, D.C.